The “Large Randomised Trial of Continuous VS Interrupted Compressions in Out-of-Hospital Cardiac Arrest” has involved 23.698 patients. 12,647 were randomly assigned to the CCC group and 11,051 to the ICC group. Vital status was available on 23.485 (99.1% of the enrolled patients). In this big cluster CCC as compared with ICC did not signifcantly improve overall survival or neurologic status. 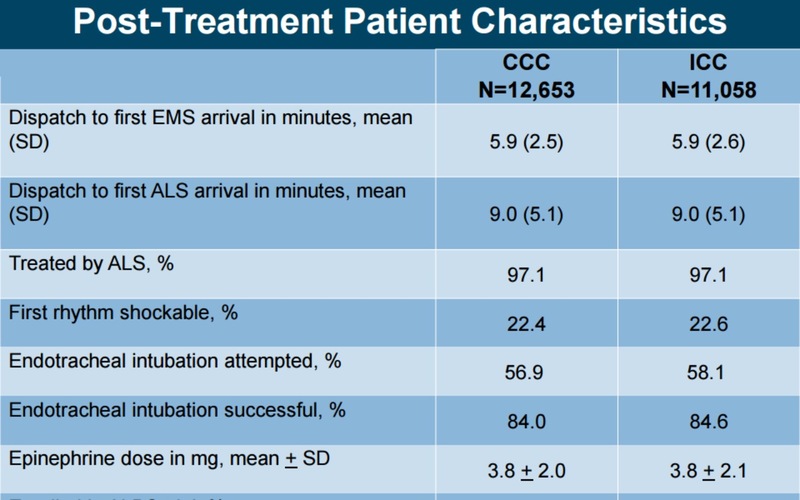 We publish the PDF presentation and the slides of the Large Randomized Trial of Continuous versus Interrupted Chest Compressions in Out-of-hospital Cardiac Arrest. Manikin or not manikin: Are you ready to learn CPR only with a video?